I read this article and found it very interesting, thought it might be something for you. The article is called India’s Leather Exports Decline, As Cow-Related Violence Increases https://www.indiaspend.com/indias-leather-exports-decline-as-cow-related-violence-increases-99395/. New Delhi: Exports of India’s leather industry declined more than 3% in financial year 2016-17 and 1.30% in the first quarter of 2017-18, according to the latest available figures, compared to a growth of more than 18% in 2013-14, according to an IndiaSpend analysis of trade data. Export growth slowed to 9.37% in 2014-15 and declined more than 19 percentage points in 2015-16, the data show. The leather industry employs 2.5 million people nationwide, most of them Muslim or Dalit. India’s leather industry accounts for 9% of the world’s footwear production and for 12.93% of the world’s leather production of hides/skins. The ban on cattle sale for slaughter hit the once-flourishing leather industry and its poorest employees, especially Muslims and Dalits, The Hindustan Times reported on June 25, 2017. Leather exports shrank from $6.49 billion in 2014-15 to $5.66 billion in 2016-17, 12.78% lower than in financial year 2014-15. China, on the other hand, reported a 3% increase in exports of leather and footwear, from around 76 billion to $78 billion in 2017. “There is a 5%-6% decline in domestic supply following the reduction in cattle slaughter in the country," Council for Leather Exports chairman Rafeeque Ahmed was quoted as saying in this report by The Times of India on February 4, 2016. The index of industrial production--which measures economic activity and has specified weightage for industries--for the leather products declined 2 points in 2015-16, after a growth of nearly 14 points in 2014-15, data show. As production and leather exports declined, cow-related violence increased from one attack each in 2012 and 2013 to three in 2014, jumping to 37 in 2017, the worst year yet for such violence. The rise in such violence is particularly apparent from 2015 when farm worker Mohammad Akhlaq Saifi was killed in Uttar Pradesh . After the Akhlaq murder, 10 more died in 2015 in 12 cow-related violent incidents, eight in 2016 in 24 incidents, 11 in 2017 and seven in 2018 till date, Factchecker.in data show. The rise of cow-related incidents and fall in exports of leather goods appear to be interconnected outcomes of the government’s policies. One of the aims of Prime Minister Narendra Modi’s Make In India programme was to increase leather exports to $9 billion by 2020, from $5.86 billion in 2015-16, and grow the domestic market to $18 billion from the present $12 billion. After the first reported death in cow-related violence in India, the country waited for a response from Prime Minister Narendra Modi, which came on October 8, 2015, in the form of this statement referring to communal harmony and poverty. “Hindus should decide whether to fight Muslims or poverty. Muslims have to decide whether to fight Hindus or poverty. Both need to fight poverty together,” Modi said at an election rally in Bihar, The Hindu reported on October 8, 2017. In most attacks using the holy cow as a pretext, the victims were either Muslim or Dalit. While 115 Muslims were attacked between 2014 and 2018, 23 Dalits were attacked between 2016 and 2017. The worst year for Dalits was 2016, as they made up 34% of the victims in cow-related violence that year. 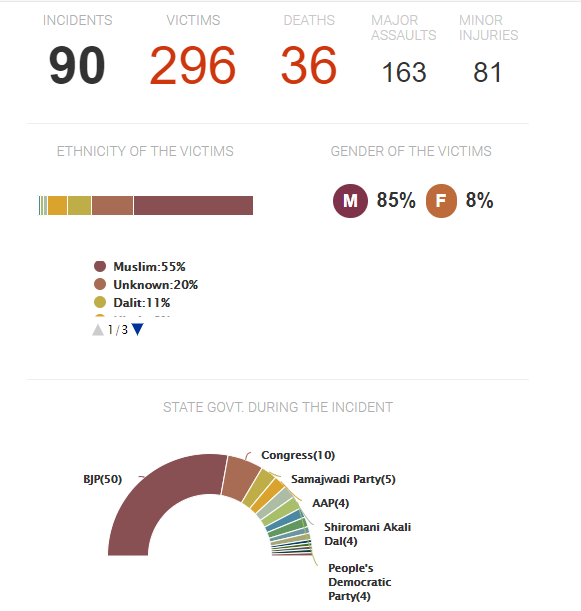 Of the incidents, 51% occurred in BJP-ruled states, while Congress-ruled states accounted for 11%. Nearly all the victims of cow-related violence are from low-income families that depend on either agriculture or the cattle or meat trade, reports said. In May 2017, the central government amended the Prevention of Cruelty to Animals (Regulation of Livestock Market) Rules, 2017, banning the sale of cattle for slaughter in animal markets across India, a further blow to the leather-goods industry. In its 2014 election manifesto, the BJP had promised the necessary legal framework to protect the “cow and its progeny”. The cow is a holy animal, called “mother” in Hindu scripture. The May 2017 notification was withdrawn in October 2017 and subsequently revised after a discussion by a group of ministers headed by transport minister Nitin Gadkari. Cattle ownership among Muslim households is 18.6%, 40% among Sikhs, 32% among Hindus and 13% among Christians, Mint reported on July 24, 2018. Around 63.4 million Muslims (or 40% of Muslims in the country) eat beef or buffalo meat. Overall, 80 million Indians eat beef or buffalo meat, including 12.5 million Hindus. Only 15% households own non-milch animals in India. If India bans the slaughter of cattle completely, the outcome can be a “serious threat” to its economy, the Hindu Business Line reported on July 9, 2017. “The additional outgo for looking after these cattle would be Rs. 5.4 lakh crore, 35 times the annual animal husbandry budgets of the Centre and all States put together”.